I can’t wait to bring you this weekend’s challenge, which is done right from a chair – talk about convenient! It’s great to practice seated exercises to strengthen your bones and muscles, but let’s not forget that excessive sitting is a growing problem in today’s society. Many Savers may be stuck indoors behind a desk for much of the day, so the Seated Core And Oblique Strengthener is just the thing to offset the detrimental health effects of sitting down for long periods. Don’t let this seated exercise fool you, though – it’s is a very effective and challenging move that targets the core muscles (including the abs), and the obliques. include most of the trunk from chest to hips, going all the way to the deep muscles along the spine and pelvis. The abdominal muscles are also part of the core, and toned abs are about more than just appearance. Strong abdominals are necessary for the correct position of the pelvis and lower back. Weak abs can contribute to a “swayback” – a forward-tilted pelvis and exaggerated curvature of the lumbar and sacral vertebrae. The Seated Core And Oblique Strengthener also works the obliques. This muscle group makes up the muscles along your ribs, sides, and abdomen, and they consist of an inner and outer layer. Reaching, twisting, leaning, and even breathing involve your obliques. If you’ve ever “twisted” your back and felt pain, then you know how important strong obliques are. When these muscles are strong and supple, they allow you to twist and rotate your torso correctly. They stabilize you upper body’s motion to prevent injury and optimize bone-building, weight-bearing exercise. The oblique muscles work with the core to promote balance. Imagine someone slipping on ice or tripping over an object on the floor. Their body will pitch off balance, and the core and obliques kick in quickly to pull them upright again. Tight, weak, or otherwise neglected muscles will fail to do this job proficiently, setting the stage for a fall and upping the potential for a fracture. So let’s take a look at today’s exercise! You’ll need a dish towel or some other small towel (even an old T-shirt works) to do this move. And of course, you’ll need a chair! Sit in a chair that allows your legs to be bent at a 90-degree angle. You can put something under your feet if necessary. Hold your hands straight out in front of you with the towel stretched between your hands. Turn your upper body to the right, raising your right knee toward the towel as you do so. Put your right foot back down and twist to the left, bringing your left knee up toward the towel and back down. Repeat this motion until you have done approximately 20 rotations, or 10 on each side (feel free to do less or more as your fitness and comfort levels allow). Do not bend your elbows; keep your arms straight in front of you and do not raise or lower them. Your buttocks should stay in about the same position. Only your upper body rotates. Make sure you move slowly and with control. How high you raise your knee is not critical, but aim for your foot to come up about 12 inches from the floor. It’s fine if you can only do a few inches, or if you can lift a bit higher. This exercise can be done in any chair at any time, which is a tremendous help in preventing the bone-damaging effects of long-term sitting. Alarmed at the amount of time people were spending in chairs, couches and cars, researchers began to study the health effects of this widespread habit. Shockingly, they found that too much sitting can actually shorten your life, giving rise to the phrase “the new smoking” to describe excessive sitting. Without physical activity, your bones and muscles weaken. Excess fat and cardiovascular problems can result. Other issues that can arise from the “new smoking” include poor posture from slouched body positions, stiff muscles, depression, and decreased bone density. Take a walk outside whenever possible, and don’t be afraid to get creative about it. For instance, why not walk when you’re using your cell phone? If you use a laptop to do your work, turn it into the mobile work station it’s designed to be: walk to a café, park bench, picnic table, etc. to get your work done. Park far away from your destination to sneak in some extra walking. Keep things out of reach, such as your glass of water, phone, or trashcan. That way, you have to stretch or get up when you need to access these items. Set up a stand-up work station so you can look at your computer screen, use your keyboard, write notes, and generally conduct “desk business” while standing up. You can even march in place or stand on tiptoe periodically to keep moving during the workday. Rather than sitting down to watch television when you come home, take the opportunity to do some “anywhere” exercises and stretches, such as the Weekend Challenges or the exercises in Densercise™. Remember, they can be done any time, not just on the weekend or during your regular Densercise schedule! When I developed a density-building exercise program, I wanted it to be simple and easy to understand, yet highly effective and challenging. The Densercise™ Epidensity Training System is all that and more. I knew that the most effective exercise program for rejuvenating bones should be accessible to everyone, and wouldn’t require expensive equipment or large spaces. So when you download the Densercise manual, the bonus Densercise Eating Guide and video link, you can get started right away, even if you’re sitting in front of your computer! 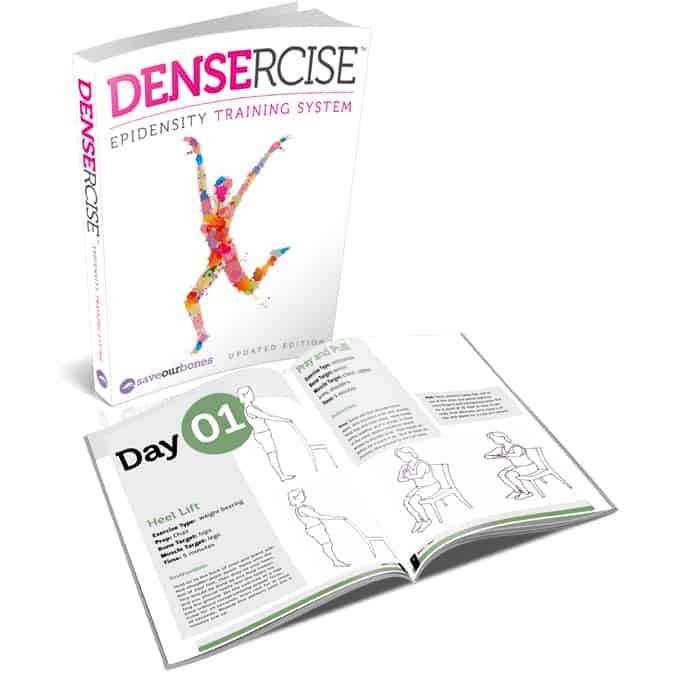 The Densercise™ Epidensity Training System combines fitness and convenience. It’s flexible, customizable, and is the only exercise program specifically designed to increase bone density. Flip The Hidden “Switch” That Builds More Bone! Please feel free to leave a comment below to share exercise tips, comment on today’s post, or let the community know how the Seated Core And Oblique Strengthener worked for you. Here’s to an active rest of the weekend! Thanks again for all the information you provide to all of us. The exercises are just what I need due to my low back spasms. You are a valuable source of help. Everyone – just a tip. I put all of Vivian’s exercises on a 3X5 card and then choose one each day. After I finish that day’s exercise, I put the card in the back of the pile. In that way I have a new 5 Minute Exercise (that is what I call them) each day. Some I cannot do but I would say 90% of them work for me. They don’t take long to do at all and are a great start to every day. Thanks, Vivian. Keep ’em comin’!! Thanks, Vivian – I forgot to mention that I always date these cards with the date of your post. In that way, I can go back to the correct post (I save them all) in the event I have a question about a specific technique. I look at emails in preview & often don’t open if I think they’re irrelevant but this one is, I’m in a wheelchair so this exercise will be good for me. Thanks. I know coffee is bad for the bones but what about dcaf coffee one cup a day. I am opening most of my emails. Maybe it is no longer obvious as Microsoft has ‘gone away’ from the programme I used and wish me to change to more modern. It tells me to download the programme, but fails to respond. when I try to do so. It gives me the alternative to use the programme designed for mobiles so maybe you don’t see me open things. Actually I find it much more straight forward as I don’t have to wait for a whole load of unrequired adverts to appear!! Bye the way you talk to me in England, United Kindom which is why I don’t respond to some of your offers. My email remains the same. It has been so since the year 2000. Just want to say thanks Vivian for all the info you supply to help everyone achieve stronger bones. Don’t always do what I should – but am inspired when I receive your emails & see other people’s journey. Glad to see sitting exercises. I always enjoy getting the weekend exercise tips. I take Yoga and do some walking. AS you send new tips I try them out and do them as well. You are welcome, Nancy! If you feel hesitant, by all means wait a bit to try exercising. Your doctor or physical therapist might have some suggestions for moves that would work for your individual situation, too. Thank you for all what you do for health for ‘older people’ to keep them healthy and moving and keep up a quality of life. I have been active with yoga for a long time and decided to take up learning the piano which meant a lot of sitting and it took not long to get pain and restriction in my core musseles and down my legs. I have taken up physical strengthening excersises and can feel the difference. Less one does, worse it gets. Pain are reminder to get back to balance. Thank you again for reminding us to keep on the balance. I think it’s wonderful that you’re learning something new, Leopoldine – you’re exercising your mind as well! I am so happy to see sitting exercises. I have MS and can’t do any standing exercises! I am so glad the seated exercises work for you, Carole! Like this seated exercise. Some years back when I was too ill do much in the way of exercise I went to a seated aerobics class and we did something similar to this as well as a lot of other exercises adapted for anyone who was not well enough to stand and exercise. The armchair aerobics was great, and most people moved on to more conventional exercise classes. I’m now doing several aerobics classes a week and running half marathons, thanks to being able to being able to start off with the seated exercises. Plus they are handy for anyone who spends a lot of their life sitting. Thanks Vivien. Your story is an inspiring example of how starting small helps you reach big goals! Kudos to you for doing what exercise you were able to, and not letting illness stop you. Looks like a great exercise – is this amount of twisting okay for someone who already has a compression fracture?